Take on the pros in Your Race to Dubai game! Golf is such a great game. Anyone could hit one single shot better than Rory McIlroy, the best player in the world. You could even beat him on one particular hole, score better than the four-time major champion. If you are really lucky – and Rory is a bit off – you can do it on consecutive holes, maybe twice or three times in a row. Four times? I doubt it. 9 holes? Only if Rory plays left-handed wearing a suit of armour and suffering from an unbearable hangover. 18 holes? Don’t even dream about it. Professional tournament golf is completely different game from the game you play. The same rule book is applied, but pretty much everything else is different. Equipment, stakes, pressure, even the courses are different. If you go to play, let’s say a course hosting a major championship, it’s not exactly the same course the pros play in the major. And yeah, skill level is different too. Compared with you, me and every single recreational golfer, European Tour pros are from a different planet. What if you could take on Rory McIlroy, play a real round of golf on any course you want, and then follow live whether Rory can match your net scores or not? It’d be cool, wouldn’t it? Well, that’s basically the name of the game in Your Race to Dubai, a new and unique fan game we have created in co-operation with European Tour. Yes, The European Tour, if you are wondering. The groundbreaking concept of Your Race to Dubai will be launched in time for the BMW PGA Championship, the flagship event of European Tour, played at Wentworth in May. 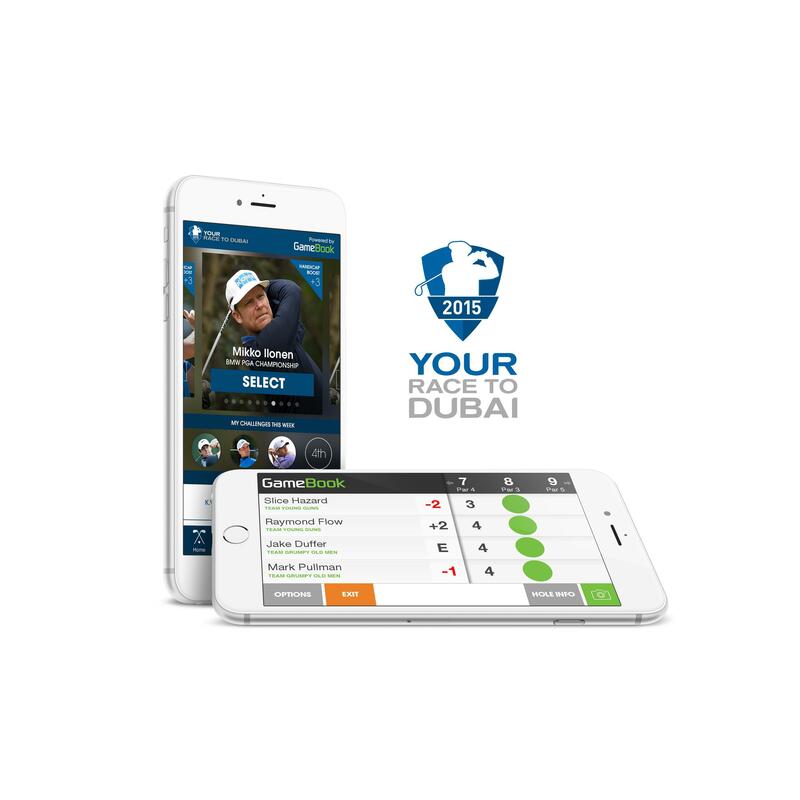 Your Race to Dubai game is played in 26 countries, mostly in Europe, and the game enables every golfer in these countries to use scores recorded on the Golf GameBook app to challenge top tournament professionals competing in European Tour events in the same week. 3. Using the app on iPhone or iPad, the fan can then watch the match play round unfold live during the European Tour event, hole by hole, sharing comments, score updates and results on social media. Each result counts toward a global Your Race to Dubai ranking, ending at the DP World Tour Championship at Jumeirah Golf Estates, November 19–22. Team GameBook is more than excited to tell this news to the Golf GameBook fans and users worldwide and launch the concept later in May. Our partner, The European Tour, can’t wait either. In the world of golf, no game like Your Race to Dubai has ever been implemented before. We expect it to give users yet another reason to engage with our app and dive deeper into the bright blue ocean of competitive golf on European Tour. More detailed rules will follow later, closer to the launch, and some really cool things have been planned around the Your Race to Dubai concept. Stay tuned, tone your swing and get your game face on. The scorecard proving you gave Rory McIlroy, Henrik Stenson or Ian Poulter no mercy, waits to be shared. And how will the courses played be compared to each other….you don’t really expect everyone to play the same Tour courses? The holes are played in relation to par. Your net score against pro’s gross score. So you can play your 18-hole challenge round on any course you want. More detailed rules will follow later closer to the launch. GameBook has proven, there are really some propeller heads in the Office! This takes the thing again onto a totally different level. I really wish I could do the same with my game. Now grinding my sore feet off at PGA Catalunya with a bunch of great pros and fellow golfers.